Cleaning : the final clean. These are the goals of the Best Cleaning Company in Miami. It is our mission: to explore strange new dirt, to seek out new bacteria and new infestations, to boldly go where no cleaner has gone before. We are on a five star trek to becoming the best cleaning company in Miami. At Best Cleaning Company of Miami, Inc., we respect and protect the privacy of our customers and those who use our websites. The following Privacy Statement provides details about how your personal information is collected and used. This privacy statement applies to the network of Your Cleaning Business, Inc. websites, products and services that are located in, but not limited to the Best Cleaning Company Miami.com domains. Best Cleaning Company of Miami is the sole owner of information collected on this site. We will not sell, share, or rent this information to others in ways different from what is disclosed in this statement. Best Cleaning Company of Miami collects information from our users at several different points on our website. Our websites offers several opportunities for visitors to register for promotional and informational mailings, tele-seminars and resources, and for assistance in evaluating our products and services. These registration forms are often linked to Best Cleaning Company of Miami's​​ mailing lists and require users to give contact information (such as name and email address). We use this contact information to send prospects and clients company information, requested subscriptions, information and resources. Users may opt-out of receiving future mailings at any time. We will never share, sell, or rent your personal information with third parties for their promotional use. Occasionally, we enter into contracts with third parties so that they can assist us in servicing you (for example, providing the best cleaning service or other customer services). The contracts prohibit them from using any of your personal information for their own purposes, and they are required to maintain the confidentiality of the information we provide to them. We may also disclose information to partners who introduced you to Best Cleaning Company of Miami services in order to ensure they are properly compensated for their efforts. Lastly, we may disclose or report personal information in limited circumstances where we believe in good faith that disclosure is required under the law. For example, we may be required to disclose personal information to cooperate with regulators or law enforcement authorities, to comply with a legal process such as court order, subpoena, search warrant, or law enforcement request. We use a variety of technologies on our sites. Among these may be cookies; a piece of information that our websites provide to your browser when you visit our sites. Cookies allow us to verify the login status of customers using products or services linked directly with our website, track point of entry to point of registration for those users participating in our affiliate signup programs, and to track and measure the success of a particular marketing campaign. Cookies also allow us to track overall site usage and determine areas users prefer, enabling us to make your visit to our websites easier by recognizing you when you return and helping to provide you with a customized experience. Usage of a cookie is in no way linked to any personally identifiable information while on our site. If you choose to disable cookies, you may still use our site; however, you may have limited access to some areas within our websites. We also use pixels, or transparent GIF files, to help manage online advertising. The information that we collect and share is anonymous and not personally identifiable. It does not contain your name, address, telephone number, or email address. For more information about how this technology works see Constantcontact.com, Google analytics and Goecart.com, and their respective cookie tracking systems. We also keep track of activity on our website via log files stored on our web servers. We collect information such as IP address, browser type and version, and pages you view. We also keep track of how you got to our site and any links you click on to leave our site. Once you leave our site, we do not track you. We use your website activity to assist us in offering you the most desired and easy to use products, services and web resources. does not control the information policies or practices of these third parties, you should review their privacy policies to learn more about how they collect and use personally identifiable information. Best Cleaning Company of Miami takes care to reinforce the importance of our website visitors’ security and privacy among our employees. Our employees are trained and required to safeguard your information and, using physical, electronic and procedural safeguards, we restrict access to personal information to those employees and agents for business purposes only. Additionally, we use internal and external resources to review the adequacy of our security procedures. When we ask for sensitive information, such as credit card numbers, we protect it through the use of encryption during transmission, such as the Secure Socket Layer (SSL) protocol. Best Cleaning Company of Miami provides users the opportunity to opt-in, opt-out or change preferences via a link in the footer of most email messages. These options are made available when you sign-up for our email lists and in email messages delivered from our company. Alternatively, you may email us at rdoherty@bestcleaningcompanymiami.com. Some communications (e.g. important account notifications and billing information) are necessary for all Best Cleaning Company of Miami customers. You must cancel your Best Cleaning Company of Miami account to unsubscribe from these communications. 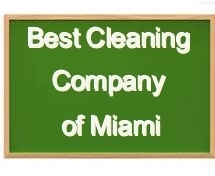 To cancel your Best Cleaning Company of Miami account, please email us at rdoherty@bestcleaningcompanymiami.com.